What Are Bull Riding Vests Made Of? 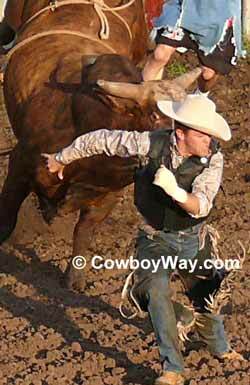 Protective bull riding vests are credited with saving countless men and women from serious injury in the rodeo arena. First worn by bull riding and bronc riding superstar Cody Lambert in the early 1990’s, a protective vest is now considered by many roughstock contestants, clowns, and bullfighters as standard equipment when performing or working in the arena. These vests offer protection from direct trauma (such as when a contestant is stomped on by a bull or bronc or hit with a horn) by absorbing shock and dissipating an otherwise crushing blow over a larger area. At the heart of the protective vest is its ability to absorb and dissipate the incredible direct trauma that can be inflicted by a bull or bronc. Once famous for containing Kevlar (a synthetic material developed by the DuPont Company in the 1960's), modern bull riding vests contain a new age of materials. Below is a brief description of common materials currently being used inside bull riding and other protective vests. Below: A bull eyes a bull rider. Note: The list below is merely for reference. At CowboyWay.com we have no idea what materials will actually be in a vest that you may purchase. High density foams used in bull riding vests are engineered to absorb and distribute impact. One type of high density foam used in some bull riding vests is Confor foam. Originally developed for the United States Space program as a material to be used in shock absorbing seats, Confor foam is superb at absorbing shock and dissipating impact without bottoming out or collapsing. It is an open cell foam that is breathable, with a soft feel that conforms to the rider. Upon extreme impact the Confor foam recovers slowly but completely. Spectra Shield is not a woven material like many ballistic materials (including Kevlar) but is instead made from layers of unidirectional fibers held in place by resins. It is 10 times stronger than steel, extremely light weight, and is used in everything from soft, concealable body armor to hard limousine doors and panels. Spectra Shield protective vests for bull riders offer excellent comfort and flexibility while still providing high-impact protection. Bull riding vests come in a wide variety of styles, but most of them have an attractive outer covering of materials like leather or Cordura (an extremely durable fabric that is resistant to abrasions, tears and scuffs). They are usually closed by a combination of zippers and Velcro, or just Velcro alone, and are designed to tear free if a bronc or bull should stick a hoof or horn inside of it. The vests are typically adjustable at the shoulders and/or the sides for a comfortable fit that won't restrict a competitor's movements. Many bull riding vests also include handy features such as pockets to hold a bull rider's mouth piece, tabs on the back for contestant numbers, and a modular construction to allow for fast, easy, and less expensive repair. Some models also come with a built-in neck brace to support the bull rider's neck.